Satanists against dogma-based definitions of "Satanism"
To us, a Satanist is anyone with a favorable view of Satan. We define "Satanism" not as any one particular belief system, but as a general cetegory of belief systems all involving a favorable view of Satan. There are many different kinds of Satanism, or, one might say, many Satanisms. A theistic Satanist is one who reveres Satan as a deity. Other Satanists we refer to as symbolic Satanists. A symbolic Satanist does not believe in Satan as an actual entity, but, instead, regards Satan as a symbol of values which a given particular Satanist endorses, usually including individuality and independent thought. 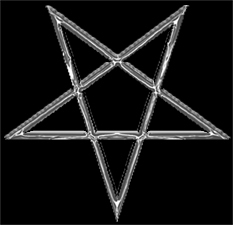 More recently, some very different "traditional Satanist" groups have emerged, claiming that the only "true Satanism" is a more-or-less-pure inversion of contemporary evangelical Christianity, complete with belief in the Rapture (seen as a blessed occasion on which all those annoying Christians will finally go away) and awaiting the reign of the Antichrist. Dogma-based definitions are a never-ending source of pointless bickering within the Satanist scene. People of all kinds who fit our definition of "Satanism" - especially those who actually worship Satan as a deity - are naturally going to think of themselves as Satanists, and thus will inevitably be in conflict with those whose definitions exclude them. The idea that a Satanist must believe XYZ in order to be a "true Satanist" is contrary to the very things most Satanists believe that Satan stands for in the first place. The vast majority of Satanists - even many of the dogmatists themselves - believe that Satan stands for things like individuality and thinking for oneself. For some of the reasons why someone might have a favorable view of Satan, see What Is Satanism?. See also Satan and "Evil" in Christianity (and Satanism) on Diane Vera's Theistic Satanism site. For a sampling of some of the many theistic Satanist theologies, see The varieties of theistic ("traditional") Satanism and Other theistic or theistic-friendly Satanism/"LHP" websites, also on Diane Vera's Theistic Satanism site. And, for the views of some scholars of new religions, see The definition of "Satanism" according to new-religion scholars and other observers. The Black Goat Cabal is an online network of Satanists (and a select few non-Satanist sympathizers) who reject dogma-based definitions of Satanism. We do not have a problem with individual Satanist groups defining themselves based on a dogma, but we do reject all attempts to define "Satanism" as a whole in terms of any specific dogma. We especially oppose those dogma-based definitions that have the greatest chance of gaining either popular or scholarly acceptance, namely the LaVeyan would-be monopoly and the idea that "true Satanism" equals pure or close-to-pure "inverse Christianity." To us, Satanism is about Satan, not about any specific set of ideas regarding Satan, beyond a generally favorable view. To the above ends, we aim also to raise the public visibility of those Satanisms which defy the more popular (either among Satanists or among non-Satanists) attempts at a dogma-based definition of Satanism. Thus, we aim to raise the public visibility of those forms of Satanism that are neither heavily LaVey-based nor heavily rooted in popular stereotypes such as "reverse Christianity" - although we do not believe in being purists about avoiding either LaVeyan ideas or "reverse Christianity" either. When the Black Goat Cabal was first founded, its aim was to raise the public visibility of theistic Satanism. Primarily we still aim to raise the public visiblity of theistic Satanisms, especially those whose roots clearly extend beyond the Abrahamic tradition, but now we aim also to raise the public visibility of some non-LaVey-based symbolic Satanisms as well. Yet we do confine ourselves to endorsing law-abiding forms of Satanism only. And, other factors being equal, we will favor those forms of Satanism that seem to us to be the best-developed in terms of either intellectual substance or occult practice or both. To assist, in whatever way we can, those of our members who are working to advance the public visibility of both theistic Satanism (also known as traditional Satanism) and non-LaVeyan forms of symbolic Satanism, both online and in the real world, both within the alternative religion scene and in the world at large. To assist, in whatever way we can, those of our members who are calling public attention to the dangers posed by anti-Satanist scaremongering (which has harmed a lot of ordinary mainstream folks, not just Satanists -- see Against Satanic Panics) and by the growth and political power of the more fanatical forms of the Abrahamic religions. To help Satanism become a more philosophically sophisticated subculture. To encourage Satanists to THINK about their beliefs, whatever they may be, and to study a variety of religions, mythologies, occult systems, and world views. We regard our above-listed aims #2 and #3 as not only desirable in themselves but also the most natural form of public relations for theistic Satanists at the present time. The Black Goat Cabal welcomes Satanists of all kinds, both theistic and symbolic, who share our aims, excluding only those few who practice or advocate violent criminal activity (murder, cruelty to animals, child molestation, harassment, etc.) in the name of any religion or god. We welcome theistic Satanists of many different kinds, including those who identify as "Devil worshipers." We reject the use of the term "Devil worship" as a scapegoat category. We also welcome a few select non-Satanist but Satanist-friendly Pagans and occultists who wholeheartedly support our goals. The Black Goat Cabal is not a "Satanic unity" group per se. The Black Goat Cabal's founder does not believe that "Satanic unity" is feasible at the present time, because too many Satanist groups have a fierce attachment to dogma-based definitions of "Satanism." However, it seems clear to us that if anything resembling "Satanic unity" is ever to be achieved, then an essential prerequisite would be for Satanists en masse to reject all dogma-based definitions of the term "Satanism." Therefore, we would encourage all "Satanic unity" proponents to join us in opposing dogma-based definitions of the word "Satanism," rather than seeking to develop a least-common-denominator minimal dogma-based definition. As we see it, the only reasonable purpose of "Satanic unity" would not be to promote even some very minimal particular set of beliefs, but merely to work together to protect our religious freedoms. Even a very minimal dogma-based definition would not give us "unity" but would only give us yet another thing to quarrel about. Satanists en masse need to learn either to (1) agree to disagree or (2) debate with each other without insisting that their opponents are "not Satanists" or "pseudo-Satanists." We totally reject the notion that Satanism is or should be defined in terms of the writings of Anton LaVey, or in terms of any subset of LaVey's writings such as his "Nine Satanic Statements." We acknowledge that most (not all) of today's forms of Satanism are influenced, to one degree or another, by LaVey's writings. But Satanism can also be based on other sources, many of them older than LaVey. The word "Satanism" was in use long before LaVey was even born, and its primary definition in most dictionaries still is "the worship of Satan," with no mention of LaVey. Thus, LaVeyans have no copyright on the word "Satanism." Black Goat Cabal members share an understanding that Satanists do NOT, as a general rule, have any specific set of political or social goals in common. Satanists do NOT, for example, necessarily agree with LaVey's political and social views. Therefore, we reject the idea that Satanism per se is or should be a sociopolitical movement of any kind. The only political goal we think Satanists should unite around is defense of the rights of religious minorities, in alliance with open-minded people of other religious minorities, not just Satanists. Unlike some people in the Satanist scene, we believe that it is both desirable and feasible for at least some Satanists to be public about their beliefs. (See Should Satanists care about the reputation of Satanism? and We are not friendless by Diane Vera.) However, it is up to each individual to decide how public one is willing to be, if at all. We do not believe in pressuring Satanists to go public, but we do reject the idea that a "true Satanist" shouldn't go public. Educating Pagans and people of other minority religions about the budding new wave of "Satanic" panic and encouraging them to examine and publicly debunk the panic itself rather than just saying "We're not Satanists." (See, for example, To Pagans and occultists on Diane Vera's Against Satanic Panics website.) Ditto for controversial nonreligious subcultures such as the goth scene and the metal scene. Promoting the idea that the alternative religion scene as a whole can become a much more politically powerful community - and hence a better counterweight to Abrahamic fundamentalism/traditionalism - by following the example of the gay/lesbian/bi/transgender community, which consists of many different kinds of organizations, including political groups (of many different stripes), professional groups (gay teachers, gay cops, etc. ), student groups, religious groups, athletic groups, hobby groups (e.g. gay science fiction fans), and a wide range of support groups dealing with almost every conceivable personal problem. So far, the alternative religion scene consists mainly of just religious groups and not much else. There are a few political groups and a few professional groups (e.g. groups for Pagan cops and Pagan nurses), but not very many. The alternative religion community could be greatly strengthened, as a sociopolitical entity, by having more organizations that aren't religious groups per se but which are targetted at the alternative religion community and welcome people of a variety of alternative religions. And, to the extent that WE are the organizers of such groups, we can thereby ensure that they welcome Satanists too, as well as people of other alternative religions. For more about this matter, see Satanists and the alternative religion/spirituality community by Diane Vera. Encouraging Satanists and people of other alternative religions to start taking seriously the question of how we can reduce the likelihood that adherents of alternative religions will end up converting back to Christianity. We need to find better ways to break the hold that the Abrahamic thought-form still has over a lot of people, and we need to encourage Satanists and others to stop assuming that Christianity and Islam are where "the sheep" properly belong. In fact, it would be in our best interests for "the sheep" to belong to a variety of different religions rather than all united under just one religion or just a few closely related religions. Another of our subsidiary aims is to call public attention to the dangers posed by the growth and political power of the more fanatical forms of the Abrahamic religions. Yet, while mindful of the grave dangers posed by today's fundamentalist/traditionalist Abrahamic resurgence, we should avoid undue paranoia about the Abrahamic religions and their adherents. For example, it should not be assumed that any alternative religionist who engages in any kind of interfaith dialogue with Christians is necessarily a sell-out, or that organizations like CUUPS are part of a plot to convert Pagans to Christianity. Nor is it productive to promote any kind of blanked bigotry toward all Christians, Muslims, Jews, or Noahides, though we make no bones about critiquing the Abrahamic religions themselves. The Black Goat Cabal existed from 2003 to 2007. It consisted of an inner circle of participants in Diane Vera's Theistic Satanism forums (which no longer exist). Black-Goat, a semi-private forum open to Satanists and a select few non-Satanists but Satanist-friendly Pagans and occultists who wholeheartedly support our goals, and whom we have already gotten to know a bit, usually via participation in one or more of our public, open-membership Theistic-Satanism forums. Black-Goat-Cabal,, our private forum, for people who not only share our goals but who are actually working in some public or semi-public way to advance them. One of the Black-Goat-Cabal forum's purposes is to provide networking helpful toward some of our individual public relations efforts, especially some of our dealings with with the alternative religion community. We also aim to discuss various issues of concern to theistic Satanist leaders and spokespeople. BGCabal-membership, private forum of the Black Goat Cabal's membership committee, which processes membership applications for the other two forums. Leading members and online representatives of theistic/"traditional" Satanist groups and non-LaVeyan symbolic Satanist groups. Satanists (and perhaps a select few open-minded non-Satanist occultists, "dark Pagans," etc.) who are leading members of other kinds of groups including "Satanic unity" groups (which welcome both theistic/"traditional" and atheistic/symbolic/"modern" Satanists), other occult groups, "dark Pagan" groups, etc., and nonreligious groups which bring together people of a variety of alternative religions. Published writers, artists, musicians, etc., who may or may not be openly Satanists or people of other alternative religions themselves, but who in either case are speaking up in some public way on behalf of either theistic Satanism or non-LaVeyan symbolic Satanism. Minority religion civil rights activists. Minimum age of members of the private Black-Goat-Cabal forum: 18 required, 21 preferred. There was no minimum age for participation in the Black-Goat email group, though we did require all Black-Goat members to behave like mature adults. To help maintain privacy and a sense of fellowship, both the semi-private Black-Goat forum and the private Black-Goat-Cabal forum had minimum participation requirements, as detailed in the rules section of the Black-Goat forum description. Diane Vera, the Coordinator of the Black Goat Cabal, has been active in the public Satanist scene off-and-on since the early 1990's C.E. She is best known for her articles on Satanism addressed to Pagans, including Satanism and the History of Wicca, and a column in the occult zine Abrasax back in the early-to-mid-1990's, during which time she also co-moderated some of the world's very first Satanic E-lists, hosted on necronomi.com. She left the public Satanist scene in the late 1990's and returned in the fall of 2002 C.E. On October 27, 2002 C.E., a group that will referred to here as Cathedral B was founded, by a person who will referred to as B.M., as a group for "traditional" / theistic Satanists of all kinds. Cathedral B was originally managed by an online-based council. Diane Vera, one of the charter members of the council, created the original Cathedral B website and the Black-Goat email group in November 2002 C.E. She also created her own separate Theistic Satanism website and email groups. By May 2003 C.E., B.M. 's goals had changed. He wanted Cathedral B to become more focussed in its aims, more like a church, with its own theology, centered around an offline coven he had founded in Texas on January 27, 3003. However, Diane Vera, the most active member of Cathedral B's council and the owner of both the Black-Goat forum and Cathedral B's original website, wanted to continue the online activities of Cathedral B as a group for "traditional" / theistic Satanists of all kinds. There was also a disagreement over governance. In May 2003 the Black Goat Cabal also expanded upon its original aim by taking on the new aim of bringing together people who were working to advance the public visibility of "traditional" / theistic Satanism in various ways. Until October 2004, the Black-Goat forum was run as a public, open-membership, moderated forum (whereas the Black-Goat-Cabal forum itself was and still is a private, restricted-membership, and unmoderated). In October 2004, the Black-Goat forum became semi-private, using the public Theistic Satanism forums as a place to screen potential members. Approximately two hundred lurkers in the Black-Goat forum were deleted and invited to join our public forums. Until April 2005, Black-Goat was a forum for theistic Satanists only. In the fall of 2002, when the Black-Goat forum was founded, there still were very few theistic/"traditional"/spiritual Satanist forums online, and none of them were yet very big. So, the Black-Goat forum's original main purpose was simply to bring together a variety of different kinds of theistic Satanists. Our theistic-Satanists-only policy was instituted to avoid quarrels with the then-still-far-more-numerous atheistic symbolic Satanists. However, by 2005, the majority of the more popular Satanist forums, at least on Yahoo, were now theistic or theistic-leaning. With that in mind, Diane Vera began to consider other ways in which the Black-Goat forum could better serve the goal of further advancing the public visibility of theistic Satanism instead of being just another forum for theistic Satanists. The Black-Goat-Cabal forum itself was fairly active during most of 2003, into early 2004. Its original purpose was simply to bring together a variety of theistic Satanists leaders and spokespeople in a relatively private setting. It then became inactive for most of 2004 and early 2005, during which time some of its purposes were diverted to other private forums run by Diane Vera, such as Theistic-Satanism-defenders. Beginning in April 2005, both the Black-Goat and Black-Goat-Cabal forums were launched anew with a new set of aims having to do with theistic Satanist public relations, mainly in the context of the alternative religion scene. Not very many theistic Satanists turned out to be interested in working together with us on these aims, which therefore are no longer our primary aims, though we retain them as subsidiary aims. In September 2006, Diane Vera was contacted by a Mike Margolin, founder of the Sinagogue of Satan. Mike Margolin is a non-LaVeyan symbolic Satanist who, like Diane Vera, has been working to oppose dogma-based definitions of Satanism, especially the LaVeyan would-be monopoly. The focus of the Black Goat Cabal then changed to opposing dogma-based definitions of Satanism in general and working to raise the public visibility of those forums of Satanism (theistic or symbolic) that would be most helpful in challenging dogma-based definitions. In 2007, Diane closed down the Theistic Satanism Yahoo groups because, as of mid-2006, she could no longer find anyone to co-moderate them. She then turned her attention to other matters, including building her offline groups.